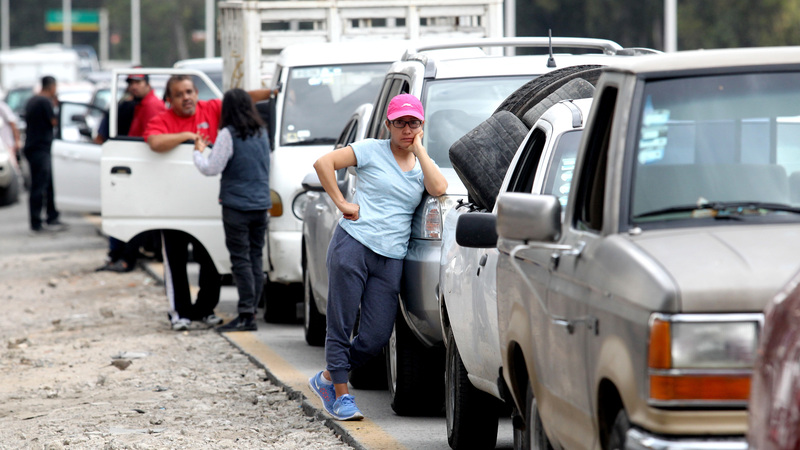 Mexico's President Andrés Manuel López Obrador says his crackdown on gas thieves in the country is working, even though long lines at the pump in several states persist, distribution bottlenecks continue and new acts of fuel theft are reported. As he has done every day since the gas crisis, now well into its second week, López Obrador insists gas sales and distribution will stabilize soon. "We haven't stopped working on returning the service to normal, we are not without gas, all is moving forward," the president said at his daily morning news conference on Tuesday. He also reported new acts of what he called "sabotage" and drilling into the state oil company Pemex's main gas pipeline late Monday. Thieves tap into gas and diesel pipelines and siphon out the fuel to sell on the black market. Much of the theft is committed by organized crime gangs, many times with complicity of Pemex workers and officials. Fuel theft in Mexico has increased sharply over the years, with losses for Pemex totaling $3 billion in 2018 alone, according to a government estimate. The government said it dispatched 5,000 members of the armed services and federal police to guard points along the pipelines and Pemex distribution sites to cut down on the theft. Armed escorts now accompany truck drivers on their routes. Last month, López Obrador shut down six pipelines to thwart the thieves and began trucking gas to stations, a much securer but slower and costly alternative. Within a week, fuel shortages led to shuttered stations and long lines around the country. López Obrador says Pemex will purchase 500 more gas trucks to get the fuel to even more stations. He said those purchases would be made from the money saved by cracking down on the theft. The widespread shortages and ensuing economic losses for businesses have put the president on the defensive. Critics say his crackdown on corruption, while admirable, was impromptu and ill-planned. Members of the opposition National Action Party began distributing a video calling the president incompetent and his plan irresponsible. And congressional legislators cried foul when members of the Cabinet failed to show up to a hearing investigating the gas crisis. So far, López Obrador is weathering the storm. Polls from several newspapers this week show strong support for his plan to combat gas theft. The heist is colloquially known as huachicol or huachicoleo. The term is related to guacho -- believed to originate from the Mayan word waach -- which means "thief" in parts of Mexico, according to the Diccionario de Mexiconismos. Until supplies return to normal, López Obrador continues to warn against panic buying and pleads for more patience. It's hard to tell how long Mexicans' patience will last. Social media is full of pictures of winding lines of cars waiting hours for gas, as well as videos of fights breaking out. Tweets of Mexican humor abound too. In one meme, which viewers say was recycled from Venezuela's gas crisis, a man is on one knee proposing to his girlfriend. He doesn't have a ring to offer, but a gallon of gas. Another shows a Valentine's Day suggestion: bottled regular and premium Pemex gas, available in stylish perfume bottles. Or for the kids, there's a new toy truck — with Tonka-style packaging. It's a standard pickup, with full containers of stolen fuel in the back. And a favorite: a tweeted image of the side of a stained old gas container, which on first glance looks a lot like an ancient Aztec or Olmec statute. The caption reads God of the Gasoline.